On the date of 3 Corinthians: early or late 2nd century? 3 Corinthians, which is an apocryphal correspondence between the Corinthians and Paul, is a text that many scholars date to the end of the second century (e.g., Benjamin White, Steven Johnston, Richard Pervo, Gerard Luttikhizen). The argument hinges upon an apparent lack of specificity with regards to the heretics mentioned: i.e., its aim is all gnostics. On the other hand, several other scholars, myself, Rordorf, MacKay, D’Anna, believe that the heresy appears to agree with great specifity with Saturninus (early 2nd century), as described by Irenaeus, haer. 1.24. While there has really been no extended arguments with regard to the date of 3 Corinthians, it would seem that much of what goes among late daters is either a case begging the question or a violation of Ockham’s razor. So for example, these scholars also date the Pastoral Epistles late, early second century, and therefore, 3 Cor must be even later. This is a tendency I am starting to resist. I think that Acts of Paul is dependent on 3 Cor. But I would still wish to propose a date for 3 Cor independently of considerations about the date of the AP lest I fall into circular reasoning or into building a hypothesis on a hypothesis. Il semble donc que l’on doive résister à la tentation d’identifier à tout prix et de manière précise l’hérésie combattue par la Correspondance. Par l’identification d’un groupe particulier ou d’un système particulier à partir des notices d’Irénée, le chercheur d’aujourd’hui risque d’être victime de la classification hérésiologique que construit ce dernier. Irénée s’applique en effect à présenter le gnosticisme comme un phénomène systématique, dont les nombreuxes ramifications peuvent se ramener à un ancêtre commun qui est Simon le Magicien, qu’il considère comme le “père de toutes les hérésie”. On the other hand, 3 Cor could be an early example of a text which tries to demonstrate the later heresies go back to arch-enemies of the first century; Justin lists Simon and Menander together (1 apol 56); Hegisippus lists gnostics of the second century as deriving from Simon, Cleobius, Dositheus, and Gorthaeus (in Eusebius, h.e. 4.22.5). There is no reason to think that Irenaeus was the first to do this. The important thing is not so much whether Irenaeus accurately depicts the views of individual gnostics, but whether he accurately depicts the orthodox view of what these gnostics each taught. In that case, we have a very good match of 3 Cor’s opponents and haer. 1.24. Late daters tend to neglect certain other criteria for dating 3 Cor. 3 Cor exhibits no specific signs of polemicizing against Marcion, no advanced form of gnosticism (like Valentinus or Basilides), and a very primitive church structure (the lead presbyter is a primes inter pares). Its orthodoxy is very similar to Ignatius of Antioch. There is thus no reasons to suggest that it doesn’t belong to the first quarter of the 2nd century, and other reasons why it doesn’t belong to the late 2nd century. The Ephesus story is a Christian version of “Androcles [or, more corrrectly, Androclus] and the Lion.” …The story appears in the Attic Nights of Aulus Gellius (5.14; ca. 160 C. E.). Gellius borrowed it from Apion’s Aegyptiaca (first century C. E.), but no doubt the story originated in oral tradition. At the theater in Corinth, archeologists have discovered at the bottom of a wall enclosing the orchestra a series of painting sof human figures fighting with wild animals, under one of which is an inscription reading: “The lion recognizes the man under the bull as his savior and licks him.” Since the orchestra wall dates from early in the first century C. E., the tale apparently was popular lore by that time. I personally doubt that Apion lied, by taking an oral story and pretended it was something that he himself had seen. It seems more likely to me that the back story which Androclus told was part of the show. I.e., there’s a sucker born every minute. Androclus claimed to have been a runaway slave who healed a lion of a thorn in his paw while hiding in Africa and to have lived three years in the cave on the food that the lion provided him. Afterwards, he grew weary of the food that the lion brought him, and he returned to civilization only to be arrested for being a runaway and condemned to die in the games. Then, the lion whom he had succored in the cave was the very same that they released against him. So he claimed. The whole story was probably just a concoction and that Gaius Caesar was likely privy to the actual facts. Androclus was more likely a lion tamer and never a runaway slave. His leading the lion around the streets of Rome on a leash afterwards basically gives it away. Spectacles often have an element of deception in them, for people want to be shown a good time. One of the strongest affirmations of the divinity of Christ occurs in Greek Hamburg Papyrus (IX, 13): εἷς Χριστὸς Ἰησοῦς καὶ ἄλλος οὐκ ὑπάρχει· This sentence resembles 1 Cor 8.6: ἀλλ’ ἡμῖν εἷς θεὸς ὁ πατὴρ ἐξ οὗ τὰ πάντα καὶ ἡμεῖς εἰς αὐτόν, καὶ εἷς κύριος Ἰησοῦς Χριστὸς δι’ οὗ τὰ πάντα καὶ ἡμεῖς δι’ αὐτοῦ. 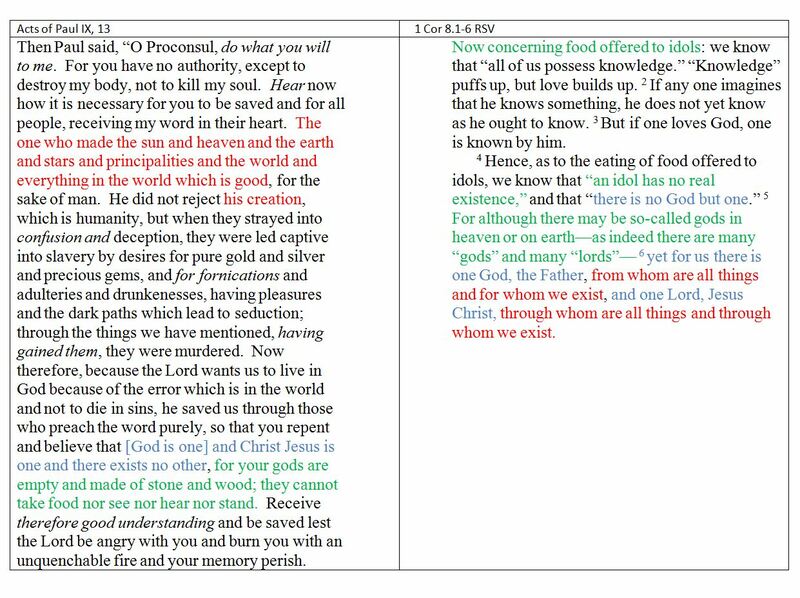 AP IX, 13 shares three common themes with 1 Cor 8.1-6: These are: (1) A polemic against idolatry: both argue that idols represent false gods: The Acts of Paul says they are empty; 1 Cor argues that they have no real existence. (2) Both raise the language of the Shema, in order to affirm what R. Bauckham calls Christological monotheism. The Lord Jesus Christ is the one Lord of the Shema and affirmed thus as the one eternal Creator. (3) Both texts affirm creation theology–that God created the heavens and the earth and humanity. 1 Cor 8.1-6 (RSV); Acts of Paul IX, 13, my translation (italics are restored from Coptic Bodmer XLI. The Acts of Paul seems to base the story of Paul’s conversion upon Galatians 1.11-17. A verbal comparison of the English helps us to see clearly possible influence. The translation of the AP from Coptic is mine. Biblical passages are from the RSV. Some have experienced the situation when reading the Bible that someone asks where to find a particular passage, and someone else will volunteer, “That’s on page 1123.” This is an absurdity, and often just a little joke, because most experienced Bible readers know that many versions, editions, and prints of the same editions differ in their pagination, and that it is proper when citing the Bible to use the primary sources reference, i.e., a convention of chapter and verse which is mostly the same in every modern edition and translation. Violations of this principle of properly citing primary sources can cause confusion and consternation. If for example a scholar cites an English edition by page number instead of the primary source reference. It implies two unfortunate failures: (1) that the writer does not know the correct manner to cite primary sources; (2) that the scholar is unacquainted with the original text but depends wholly on a translation. 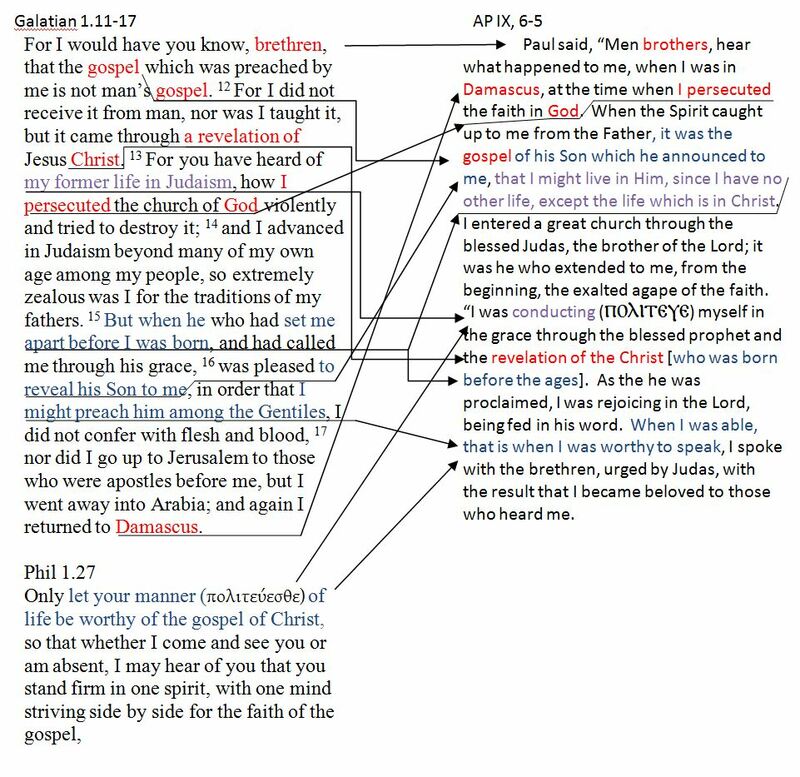 The question remains as to how to go about citing the Acts of Paul, since so many MS discoveries have increased our knowledge of the whole, adding new chapters as our knowledge increases. The answer, for now, is to consult Willy Rordorf (Greek), Pierre Cherix (Coptic) and Rudolphe Kasser (Coptic of Bodmer XLIX)“Actes de Paul”, in François Bovon and Pierre Geoltrain, eds., Écrits apocryphes chrétiens (Bibliothèque de la Pléiade, Saint Herblain: Gallimard, 1997). Rordorf divides the Acts of Paul into 14 acts. These are indicated by Roman numeral followed by a comma, and then the paragraph (e.g., III, 3 = Acts of Paul and Thecla 3; Acts of Paul IX, 10 = Ephesian episode, 10 paragraph). Now this may seem arbitrary. Why not use the numeration in Schneemelcher or Elliot? The answer is that Rordorf et al. are preparing a text of the Acts of Paul for CChrSA (Corpus Christianorum Series Apocryphorum, Brepols) and it will be the most complete and up-to-date text of all the available evidence. This edition has been long in coming but should imminently see the light of day. It is thus better to use this system, to which translations will eventually conform, than to use older translations like Schneemelcher, which are already out of date the moment “Actes de Paul” (in E.A.C. vol 1) was published in 1997.